The patient, a diabetic, suffered an injury to the calf in a workplace accident causing an acute wound. He initially attended his local surgery for an assessment and was advised that he would need to attend a wound clinic on a weekly basis. The dressing protocol followed Winters theory of moist wound healing. 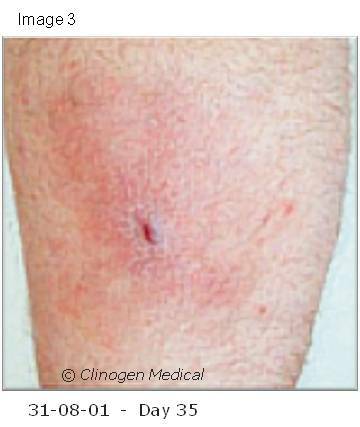 Initially the wound was treated with an occlusive dressing which was renewed at the wound clinic on a weekly basis. 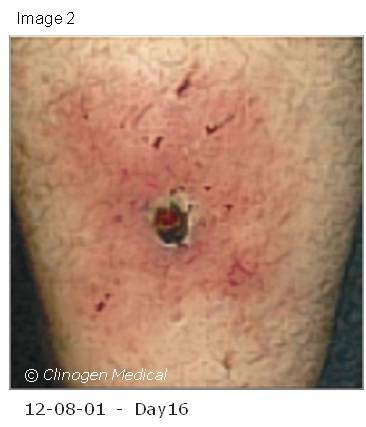 In this case the type of dressing used caused trauma and inflammation to the wound site as a result of so called “rip and pull” trauma from repeated dressing changes; the condition of the wound gradually worsened leading to it being classified as a chronic ulcer after 1 month. The dressing protocol was revised and to three-layer compression bandages which continued for a further 7 months. There was continuous exudation and the patient felt a great deal of discomfort and loss of concentration at work. 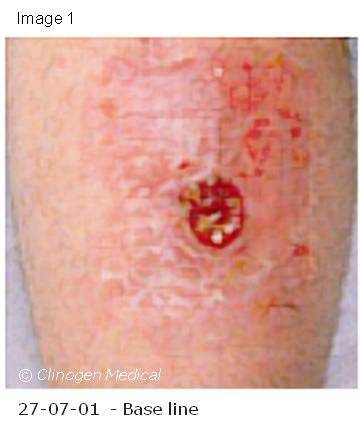 Seeing no improvement over an 8 month period, the patient opted to follow a dry wound healing protocol comprising Youki Bio-Cell Spray and Youki Skin Repair Cream (Image 1). The patient used both products as directed: – application of Youki Bio-Cell Spray to the wound site and inflamed skin surrounding wound site 8 times a day and allowed to dry for 10 minutes, and then the protein-rich skin repair cream applied to inflamed but non-broken skin surrounding the wound site applied 4 times a day. With the formation of a thick film, the patient was advised to ensure that the free edge of both the wound and film was kept hydrated. 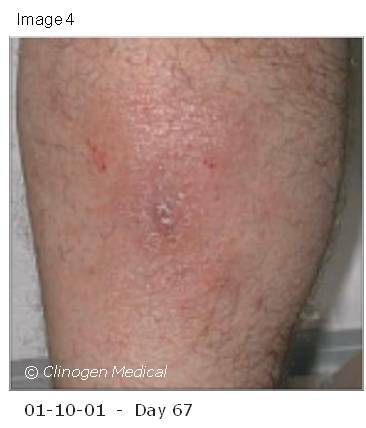 Within 1 week of following the above protocol a significant improvement was visible; the trauma to the skin surrounding the wound site caused by repeated dressing changes was significantly improved and the skin appeared much less inflamed. Within 16 days the film had built up (Image 2). After the first thick film layer had formed the patient was advised that the frequency of application of the Youki Bio-Cell Spray be reduced to 6 times a day with continued use of the protein-rich skin repair cream. We advised the patient that the thick film should be allowed to remain in place and should not be physically removed, when it lifted away naturally then the patient was to increase use of the spray to 8 times a day; in this particular case the film remained intact. The wound was fully healed within 67 days from the change in wound management with minimal evidence of the initial injury. The protocol meant that the patient was in control of his own wound management with periodic visits to us to review the healing process. Initial application was spraying the wound site 8 times a day until a thick film formed over the wound site, and the use of protein-rich skin repair cream 4 times a day on the fragile and traumatised skin surrounding the ulcer. This process continued until full healing was achieved (Image 4).